A parent’s job is to create a supportive environment for their kids, giving them the space to make their own mistakes as well as the tools needed to correct them and learn from them. In practical terms, that can occasionally mean pushing your goofus kid in the dirt in order to teach them how to stop a dang shot instead of looking for gophers or whatever. 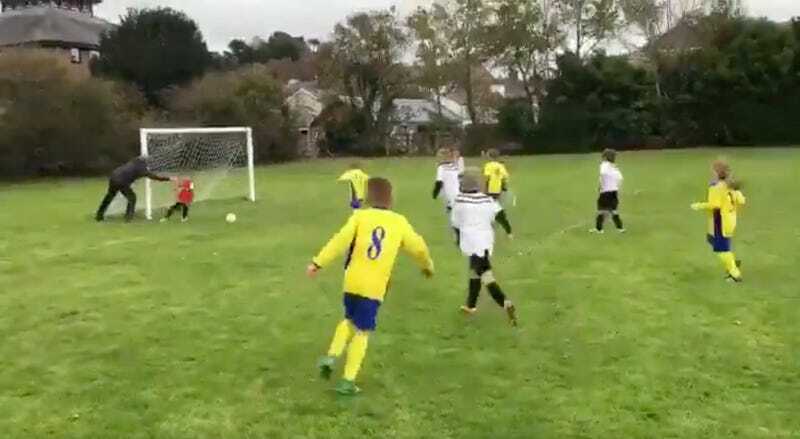 The tiny hapless goalie in question appears to play for the under-8 team of Bow Street FC, whose top team plays in the Mid-Wales League. Maybe next time his dad should pick him up after the first stop, since dude got scored on anyway.